M7123@aol.com Donald McCann Nephew of brother in law (called him uncle anyway) of Apollo Soucek Admiral Air officer October 1941, Executive officer 1942 to the end. Air officer at Midway and XO at Santa Cruz Islands. History doesn't give Soucek much credit but the Hornet crew and their heirs must remember him. I'm interested in hearing from anyone whoever met him or new of him. reiver@eoni.com Class Richard James Armstrong He was 18 when the Hornet went down and went on to serve aboard two aviation tenders, the USS Casco and USS Mackinac. WIZZER@OWC.NET Debi Barrett Jones Daughter of Gordon B. Barrett (Gordy or Red, nickname) 1941 - Transferred just before sinking in 1942. Fighting Squadron 8th-A.P (Airplane Pusher) also Carpeters Aprentice. My dad is still alive and kickin' at 82. Would like to hear from someone who may have known him. He doesn't talk about hte war much. I'm trying to gather info on his time in the service. So if you knew him please contact me, would love to hear from you. Thanks, Debi. sshaffe@ibm.net Shawn Shaffer Grandson of Millard W. Billstrom ??? - October 26, 1942. I would like to know if anyone knew Millard and could tell me more about him while enlisted. tlrb@msn.com Ryan Wiedmaier Grandson of Lewis Kenneth "Iggie" Bliss ??? - October 26, 1942. He flew an F-4F. I never really knew my Grandpappy, he died when I was a little kid. I know that he was a pilot, and he flew in the battle of Santa Cruz. If anyone flew with him, or knew him I'd love to hear about him. MLewis@remc8.k12.MI.US Margiline Boutwell Lewis Sister of William Boutwell Jr. 1942 Cook. My brother served as a cook on the Hornet around 1942. He passed recently and I would like to communicate with anyone who might have known him. Thanks! Lucky302@aol.com Krischelle Dempsey and Randall Ray Dempsey Granddaughter and Son of Raymond Francis Dempsey Commissioning to sinking of USS Hornet CV-8 at Santacruz. We have an original Daily News Digest from the ship Hornet CV-8, dated Oct 20, 1942, probably last issue. RANDALLSANDS@aol.com Randell G. Sands Neighbor of (Identical twins) Harold & Carl Endy Early 40s and were killed on the hornet. Both were cheif gunners mates. vaughnrf@aol.com Vaughn R. Farrington 3 October 1941 - sinking. 3rd Division to start, others as radar dictated. Had a box seat for this show from the forward gun director. Was able to witness most of the activity forward of the island. jgaribay@fourfrontsales.com Verne Hager July 1942 - October 26, 1942 - On Oct 26, 1942 after the bombs fell on us, I was on deck helping the chaplain collect dog tags from fallen sailors, when "Abandon Ship" was called. I boarded the USS Russell, then was transferred to the USS Juneau on Oct 28, 1942.
bgjohn65@aol.com Bobby G. Johnson Brother of James C. Johnson, Jr From commission until sunk. Served as radio operator or in communication. We did not know where my brother was serving until he arrived home unannounced late 1942 and told us his ship had been sunk. The sinking of the Hornet had not been made public until he was at home and almost ready to return to duty. bax38@gateway.net Henry P. Johnson Captain. supply officer for James Doolittle during the raid on Tokyo in 1942.
kelber@peganet.com Vickie Kelber Doughter of Victor Kelber 1941 - 1942 Marine Detachment. den39012002@yahoo.com Dennis Hill Son of Leonard J. Lewalling 1942 Pharmacist’s Mate 2nd Class. LSLitch@inetw.net Stephen W. Litchfield Son of Wayne Ware Litchfield CV 8 until ship was sunk. Would like information on my father, Crew list, Etc. I have many actual pictures of many of the battles. n6gm@jps.net George Mcclelland Cousin of Charles Moser Killed in the battle off Santa Cruz Isle. he was below deck somewhere & possibly a bomb came through the deck & killed him. I barely knew him but would appreciate anyone who can tell me more about the battle, or might have known him to email me, thank you George. normansd@yahoo.com Susan Norman Grandaughter of Albert Marshall Norman 1942 3rd Division. 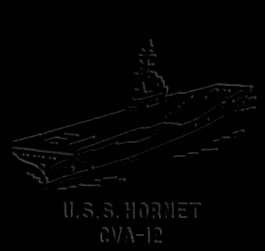 My grandfather served on the Hornet in the Third Division as a Fuse Setter on Gun #7 during WWII. I know this because of a memo I found praising the conduct in action of his division on Oct. 26, 1942. I am seeking any information that may be relevant to his time spent on the Hornet and Enterprise. Any assistance would be greatly appreciated. Kltindle@earthlink.net Kathy Pendergrass Tindle Daughter of Howard D. Pendergrass Sr., W.O. USN Ret., 1910-1977. From the Shake down cruise, up to 26 October 1942 when it was abandoned at the Battle of the Santa Cruz Islands, and was sunk. V-2 Division. An incident that he later related to my mother was that he was very tired from being wet, and was down below the deck of the Destroyer that picked up some of the Hornet crew members. While resting there, he suddenly heard guns going off up above, and at that point thought to himself, "They can have me, this time." He then went up to the deck, and realized that it was friendly fire, directed at the Hornet in an attempt to sink her. He said as he looked out across the water at the Hornet it seemed like he could see a tiny figure frantically waving that he was there and alive. He always knew that this was probably something that he imagined, due to the stress of the situation, but my mother said that he would recall that moment many times over the years that followed. After his Hornet duty, he also served abard the San Jacinto, which saw a lot of action. I also have a crew picture of his time serving aboard the USS Prince William, that has many people in it, but none other than my father is identified. He also served aboard the Arizona before Pearl Harbor, and the family has mementos from that, such as menus, etc. c.ponder@comcast.net Chuck Ponder Son of Robert C. Ponder, Jr (Bob) 20 October 1940 - 26 October 1942, Aviation Radio. Born 09 July 1901, Died 19 March 1987; Enlisted 1918 Retired 1946; Married Mabel L. Smith in San Diego, California on 25 February 1928, 2 Sons Charles and Philip; Served in Long Beach, CA, San Diego, CA: Panama Canal: New York, NY: Annapolis, MD: Norfolk, VA: Memphis, TN: As Chief on the Hornet was responsible for the Emergency radio equipment supplied on the B-25's. No E-Mail Address available Dewey E. Price February 1942 - October 1942 Cheif gunnery 40mm ante aircraft. ROMBOTOMEL@AOL.COM Donald Romanno 1939 to Sinking. Donald went down with the ship in the Battle of Santa Cruz. I would like to write to anyone knew my brother. Babebvh@worldnet.att.net William Huber Son of George T. Spence My dad served on the U.S.S. Hornet during pearl harbor He was a boatswains Mate 2nd Class. Passed away March 2000.
jfstallingsjr@netzero.net John F. Stallings Jr. 1941 - 26 October 1942 VB-8. bwhited@srnet.com Bert W. (BUD) Whited, ADRC USN Ret. Served on CV-8 from commissioning to sinking. Scouting Squadron Eight, VS-8. Would like to hear from all shipmates. Please add CV-8 to your heading. wrappack@sprynet.com Charles S. Wilhoyt son of James Charles Wilhoyt 1941 - 1942 Division: Unknown, But He was on board when it sunk at Santa Cruz. Would like to hear from anyone who might have known him as he just passed away.He was also stationed at the Truk Island,but I'm not sure exactly when. fulcher@starfishnet.com Mike Fulcher Jr. Grandson of William Bruce Willett My grandfather was aboard the Hornet when it went down in 1942. Although he has told me quite a few stories before his death in 98' I would love to hear something from anyone that may have known my grandfather. Please if anyone knew him please contact me I would love to hear from you. Is there anywhere I could find a list of all the sailors aboard the hornet apon its sinking? 10guage@msn.com Rob Otteson Great Nephew of Walt Wittcopp ???? - October 1942. I am interested if anyone can give some history on Walt, what division he was in, etc.